Connecting Environment, Culture, Conservation, and Communities Through the Malama Learning Center from Malama Learning Center on Vimeo. Mālama Learning Center is a 501(c)(3) non-profit organization incorporated in the state of Hawai‘i. 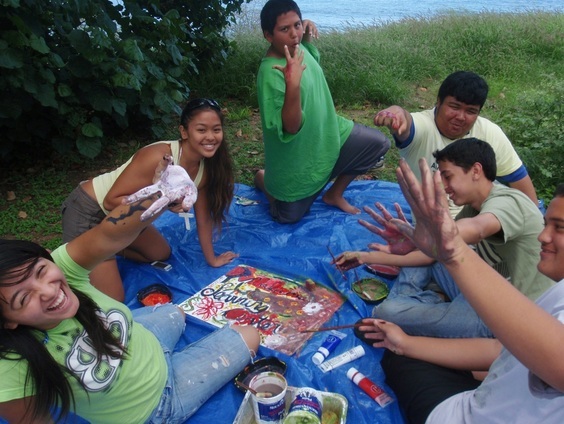 MLC evolved as a collaborative response to serve two area needs: Kapolei High School (KHS) wanted to build a performing arts auditorium for the community, and an environmental group wanted to establish a conservation learning center. Community members joined the effort and the resulting “hybrid” is MLC, a private non-profit organization envisioned as a place in West O‘ahu that brings art, science, conservation, and culture together to promote sustainable living throughout Hawai‘i. We design and deliver programs using techniques grounded in place-based and hands-on learning. Not restricted to only formal education in schools, we demonstrate how to live sustainably and culturally grounded with health and the environment as a central theme through a variety of programs reaching different target audiences. As a small non-profit, we limit our activities to those that best align with our strengths – developing and delivering programs where we can leverage our technical expertise in environmental education, natural resources management, leadership development, and collaboration. Working in formal and informal settings, we are able to strike partnerships with our extensive network of local conservation, agriculture, and nonprofit groups and academic institutions. Thus, MLC often plays a facilitative role in bringing people together to produce meaningful results. We have been planning to construct a state-of-the-art green building located on three acres on the northwest tip of the campus of Kapolei High School for some time. However, we had to put that dream on hold due to various circumstances out of our control. While we actively seek a long-term home, Kapolei High and Camp Pālehua have graciously allowed us to utilize space on their campuses to run many of our programs. To learn more about what we do, see our summary of activities in 2016. ​in its programs or activities.